One of the hardest parts about getting organized is sorting and sifting through all the “stuff”. But all this “stuff” can cause distractions and take up valuable space. When you find yourself among stacks and piles of “stuff” it feels really overwhelming. So let’s breathe and take the first step to de-cluttering your life and get started on a path to better organization. If you get more organized then you can be much more productive, more efficient with time and more effective in each of your tasks. This will reflect on your attitude to your work, your family and your private life. I know when we are overwhelmed about removing all our clutter we come up with some fabulous excuses as to why it cannot be done, such as why something cannot be thrown out, given away or reduced in quantity. It is too easy to say you might need it or you just don’t know when you will use it. We claim that we don’t have the time or that there is too much to do all at once. But as Nike says, “Just Do It”. The very first thing to throw out is the “I cannot” defeatist attitude. So right now, make a plan. Open your calendar and schedule some time to start the task of getting yourself organized. You know who you are – the person that says, “I have to keep [this] because I might need it later!” In reality much of our “stuff “can be throw away without any negative consequences. The decision to keep everything drives us to make inappropriate choices about organization and this contributes to more clutter. So let’s break that thought process and as you go through your “stuff” ask yourself, “Am I going to use this in the near future? When was the last time I needed this? If I keep this, how will I organize it”? Now getting organized doesn’t just refer to your physical things. Organization includes organizing your time and activities. Taking time to identify what you want and what you need to accomplish allows you to sort through everything on your plate and determine how to tackle it. When you write out things and clearly identify them then the task of regulating your time and energy will be easier to do. Don’t make the mistake of confusing urgent priorities with important ones. 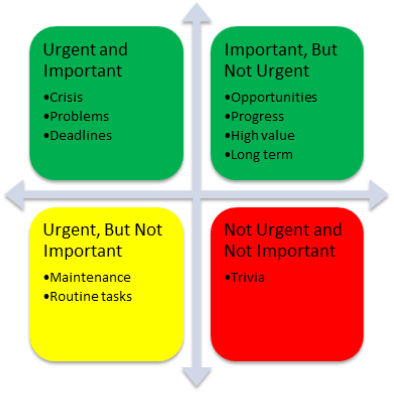 The Urgent/Important Matrix is a great tool that can help you think about your priorities and how to handle them. Before you can use the matrix make sure you have written down everything you want to accomplish and over what period of time you need to finish them. You can assign tasks to daily or weekly time periods or even further out. A typical Urgent/Important matrix is divided into four quadrants. Each quadrant is labeled differently. Using the master task list you created above, you can now plot each job in the corresponding quadrant. After you have plotted all of your tasks, have a look and tweak if necessary. Showing all your tasks in this manner helps you to see all of the things you want and need to do and how urgent or important they are to you. Now you can make better choices regarding allocating resources, managing your time and overall organization skills. So now you have your list and you know what needs to be done. Now you need to find the time to do it. Your time is valuable and should be treated as such. Time is a commodity that once passed is gone, done. That individual time segment can never be replaced. Get into the habit of scheduling all your activities on a master calendar. This ensures you allocate the necessary time to each task. It’s not a good idea to use several calendars for different areas of your life. It’s very easy to get your calendars confused unless you are using a software system that can overlap them, such as Google Calendars. With multiple calendars operating individually you run the risk of double-booking appointments or missing events. I recommend you setup one calendar and put it where you can see it every day. Smartphones, computers and notebooks all have free calendar applications. Put everything into your calendar and include task deadline dates, reccurring appointments, meetings, to-do lists, private time, workout time and quiet time. I schedule four times each week a session of thinking time. This is my time to ponder, be creative and contemplate ideas and projects. Schedule all your time into blocks and set up reminders. Now you can feel confident that you are not going to miss or overlook something you want to do. As an example, I have a daily appointment called “to-do list”. It is scheduled at 6.30 AM each day. I use this slot to keep track of small tasks that I don’t feel I need to allocate time to, plus, I am never going to schedule a meeting a 6.30 AM! So this time slot is safe and it helps me keep everything in one place. If you use one calendar for everything you do, it will help you manage your time better. Electronic calendars eliminate the paper and most of the time you have quick and easy access to them. I use Google calendars because I can have the calendar application on my desktop, Kindle, smartphone, tablet and laptop. If I add an appointment or make a change to one, it updates all my systems in real time. The same applies to my contact list. If you get really serious about getting organized then you may want to join us in our next webinar on Time Management. You can learn more here.